Recovery Industry Engineering Standards (RIES) provides efficient, expert inspections for both businesses and individuals. Irish Trucker recently caught up with company managing director and chief engineer Davy Holmes to learn more about the company and what they’ve been up to lately. Business couldn’t be much better at the moment for Recovery Industry Engineering Standards (better known as ‘RIES’) and company founders Derek Beahan and the late Clive Heathcock wouldn’t have had it any other way back when they set-up in 2004. Both men are synonymous with the recovery industry in Ireland, having each held the president’s position of the Association of Vehicle Recovery Operators (AVRO), with Derek also serving as its president and membership secretary. The pair had come up with the idea for a venture to provide a service to AVRO members at competitive rates and, as a result, RIES was formed 13 years ago. Inspection engineers were formally used by AVRO to carry out membership inspections. These engineers were then and still are self-employed. After the inception of RIES, PAS43 was introduced following the work carried out by the Survive Group. PAS43 is a form of Quality System aligned to a lesser degree to ISO 9001:2000, as it was at the time. The need for impartiality and freedom of influence meant that to achieve accreditation by UKAS (United Kingdom Accreditation Service), RIES had to become a separate entity and this accreditation was duly achieved. In a UKAS inspection, the issue of conflict of interest was raised. This meant that in order for RIES to retain its accreditation, none of the directors could hold a position in AVRO. Both Derek and Clive would step aside as a result and hand the running of the company over to Brian Drury and Davy Holmes in 2009, with Brian becoming financial and training director, and Davy its managing director and chief engineer. Now, some eight years later, Davy is happy to report that “business is very good”at RIES, where both he and Brian Drury hold voluntary positions. Interest in standards among the major recovery players in Ireland, who were also AVRO members, has always been strong and in the early days, following the introduction of PAS43, this was taken on board by the aforementioned Derek Beahan, Eamon Kelly and Alan and Cora Sherwood, who are all well-known operators in the Dublin area. PAS may not have been the standard in this country, but it was as a best practice and the members’passion to improve standards in Ireland saw the PAS applications roll in and RIES now services 43 PAS inspections in the Republic of Ireland and a further 12 up north. Today, RIES provides services to both AVRO members and non-AVRO members, with the demand for its services having surpassed the expectations of its founders. In order to meet and cope with the demand, RIES had to ensure that its engineers were up-to-speed with all equipment they were inspecting and so a training programme began and were organised. “Right now we have one guy in training in the Republic of Ireland and one guy training in Northern Ireland,”explained Davy. 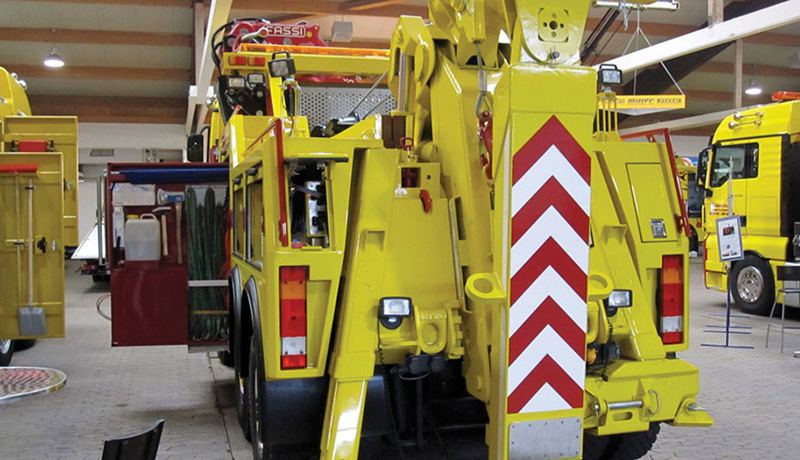 What it effectively means is that RIES now guarantees the following services: General Applications inspections of recovery vehicles; General Applications inspections of garage equipment; Bespoke inspection for Police Forces; PAS43 certification; Compressor inspections; ISO 9001:2015 accreditation; ISO 14001: 2015 accreditation; OHSAS 18001 accreditation. In-depth inspection reports are part of the services on offer along with written schemes of inspection, where necessary. “We have increased our coverage for inspections here and we’re doing compressor inspections now,”Davy explained. It’s widely acknowledged in the industry that RIES supplies a first-class service at competitive rates and the quality and content of its reports more than meet the requirements needed. The company will continue to attain this standard whilst constantly striving to identify any shortcomings it may have. To this end, RIES has a programme of client surveys and, if you are a client, RIES values your views as this feedback enables it to focus on its customer requirements and expectations of it as a service provider. With a background in vehicle inspections, accident investigations and traffic management work, Davy Holmes also runs his own company venture, DMH Consultancy Services Ltd, from Strathfoyle, which is three miles from Derry city. Set up in 2002, this company specialises in defensive driving, collision investigation, independent vehicle inspections, collision analysis, traffic management and road works signing advice. It is also UKAS PAS43 accredited. “Most of my time is taken up with RIES, which accounts for about 80 per cent of my work. DMH accounts for the other 20 per cent,”he explained. “I had retired from the police force and had a background in inspecting vehicles and observing drivers. I had basically got into it because it was something to keep me going after retirement, so I did a year-long course and started into it.